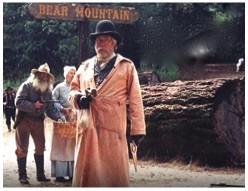 SOURDOH has been a part of the Group of Outlaws, Lawmen and Women who entertain thousands of delighted passengers aboard the Roaring Camp & Big Trees Narrow Gauge Railroad in Felton, California, for the past couple of decades. He and his compatriots bumble their way through an attempted train robbery on special Holiday Weekends. P.S. - The Good Guys always Win!